Without pain, there would be no such thing as resilience, hope or transformation. Inspiration to change your course is one hundred percent internal. There is a lot of great advice out there for the serious job seeker. But, let's narrow it down to two questions that you can ask yourself, and thus present to your potential employer that will prepare you for your time to shine. DC Comics response to a little girls request for more girl superheros...one in her own image. Every morning, I look forward to that first sip of coffee. French Pressed, French Roast piping hot. My favorite part is the foam that goes to the top of a high-quality brew. ahhhh...the joys! This morning, as I enjoy this cup of Joe and sit back to watch the Today Show, as is my typical routine, the story of an inspiring 11 year old girl from Illinois , came across the screen. A story about having a voice, standing for what you believe in and going for it! Now I can't think of a better role-model than that at such a young age. Rowan Hansen wrote to the publisher of her favorite comics, DC Comics, when she found it disappointing that there weren't more girl superhero's in the comics. She was thrilled to find that she got a response from the "big and important people." But the lesson that this teaches is that ALL of us are capable of being big and important. We just have to have the confidence to believe in our own voice and point-of-view. Way to go, Rowan! Read more about Rowan & DC Comics. As a mother to my own 11 year old girl, I share this with enthusiasm and pride because I see that the world is open to her and others like her. 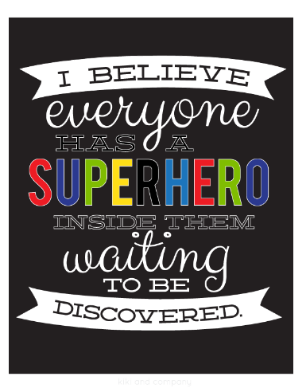 As a coach, I am motivated even more to inspire because I truly believe that everyone has an inner superhero just waiting to be discovered. How do we build self confidence when it is the one thing we are lacking?